Sophia Sokolowski ’16, a biological sciences and psychology major, recently completed a semester overseas—much of it aboard a ship in the Mediterranean. Sokolowski was one of 21 college students from the United States to be accepted to SEA Semester, a study abroad program that offers a cross-disciplinary exploration of themes related to the ocean and global environments. Students in the Global Ocean Program first spent a month with the oceanographic research community at Woods Hole, Mass. As a capstone of the semester, they then embarked on a five-week voyage through the Mediterranean Sea and eastern Atlantic Ocean. 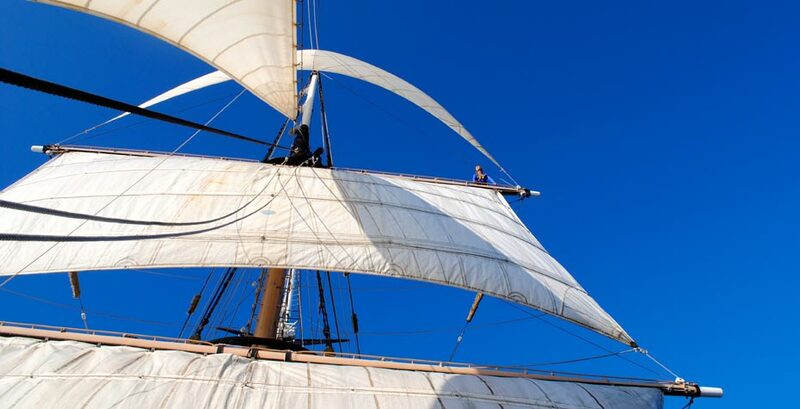 Their ship, the SSV Corwith Cramer, set sail from Barcelona in early October and made port stops in Mallorca and Cadíz, Spain, as well as in Madeira, Portugal, before arriving at the Canary Islands in November. While at sea, Sokolowski conducted research on the colonization of harmful algae on plastic debris in the Mediterranean and North Atlantic waters. “One aspect of our research that truly moved me was how 100 percent of the surface water samples collected contained microplastics, further driving home the fact that we humans are negatively impacting our oceans,” she says. In addition, Sokolowski took classes in maritime history and oceanography and was able to hone her leadership skills as an active member of the boat’s crew. Of course, there was plenty of time for sightseeing, a highlight of studying abroad. The team on the Corwith Cramer was able to try cliff jumping in Mallorca, scuba diving and hiking in Gran Canaria, and swimming in the Atlantic Ocean at an area roughly 6,800 feet deep and 500 miles from land. This spring, Sokolowski plans to switch to an entirely different track and study music—specifically opera—at the Frei Universität Berlin. She fell in love with the city after spending the previous Wintersession in Berlin with the Wellesley German Department. “I figured Berlin would be the perfect place to study opera because it is culturally and musically invigorating and rich,” she says. However, she maintains a strong interest in marine biology and can see herself conducting research at sea in the future, with the goal of raising awareness about the negative impacts of human activity on marine ecosystems. “I am specifically interested in how the hearing of marine species is affected by anthropogenic noise,” she says.